These proprietary Starfire® Systems polymers are our original technology and yield near stoichiometric SiC ceramics when converted. They are our highest strength polymers, thermally stable to 2500°C +, and available in new, hot melt versions. 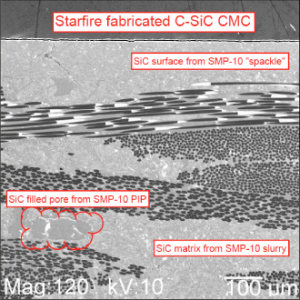 Starfire’s advanced technology offers a polymer route to near stoichiometric silicon carbides, delivering the benefits of SiC ceramic composites without the sintering and machining challenges. Our polymers form a high-strength green part with cure temperatures as low as 200°C and then form SiCs with nanoscale grain sizes as low as 800°C. Our silicon oxycarbide resins are Starfire® Systems’ newest technology that is specifically designed to offer a tough, durable ceramic for moderate service temperatures. Starfire® Systems’ technology produces low cost, high performance silicon oxycarbide ceramics with configurable properties. We have the ability to customize the ratios of Si-O-C and have the most cost effective ceramic formers on the market with services up to 1200°C.